How important is qualifying position in IndyCar? Saturday is always deemed an important day in the racing world. It’s the day qualifying takes place for the following day’s race, and the grid is set according to speed. But does it really matter where you qualify? How much of an impact does it have on the race? And does the type of track matter? Starting from pole position gets you the race win 24.1 percent of the time compared to 12 and 13.9 percent from second and third places respectively. That means that the difference between starting in second and first is a 12.1 percent chance of winning. The increase from second to third could be purely random (the sample size is relatively small at 108 races), or it could have to do with having the inside line heading into the first turn. It could be beneficial to start right behind the leader on the “good” side of the track instead of next to the leader on the outside. 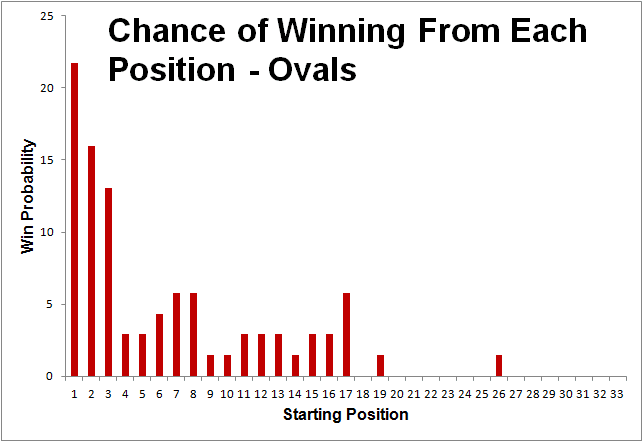 Fourth and fifth place grid positions are 13.9 and 11.1 percent chances, and the rest of field is below ten percent. No one has won an IndyCar race after starting in 14th, 18th, 21st, 23rd, or 24th — but that’s just random and not anything significant. Starting on pole position on an oval is slightly less important than on the streets, with a win percentage of 21.7 — a 2.5 point difference. Second and third places have a 15.9 and 13 percent win probability. Both of these are higher than their street counterparts. After that, no place has a win probability greater than six percent. Eight, ninth, and seventeenth places are all just below that at 5.8 percent. All in all, it actually looks pretty even between roads and ovals. Adding up the top three places’ win probability for both comes out to right around 50 percent for each. Expanding that to the top five places shows us some disparity though. The probability of a driver winning from one of the top five grid positions is 70.4 percent on the road/street courses. At ovals, that number is only 56.2. Once you get out of the top five starting positions on an oval track, everybody starts to even out — this leaves the field (drivers starting lower than P5) with a 43.8 percent chance of winning. On streets, the field only has a 29.6 percent chance. In both cases, starting up front does give you a definite advantage over the rest of the field. Ovals are more forgiving once you get past the top positions as the field evens out pretty well — the average place after P3 (up to P24, so it’s comparative to the road/street courses) has a 2.3 percent chance of winning. Single Seater will be “forecasting” each race of the 2016 IndyCar season, with win probabilities posted to the site after qualifying is over. These will be up either late Saturday or early Sunday morning — if a driver scratches from a race, an additional update will be posted. It’s easier to update and keep track of. There aren’t 20 different variables I have to gather together to make a prediction, so I can easily post them for each race. There is so much randomness in racing. Crashes, mechanical failures, caution flags — these can all have a drastic affect on the race, and they’re almost impossible to predict. Instead of trying to with a ton of variables, I just skip over it altogether. Also, it helps to distinguish the signal from the noise — data that isn’t very predictive. I’ve chosen variables that are historically very predictive of race success, and that’s it. These variables are added together for each driver and a winning percentage is determined. I’ve done research before on qualifying position and how it relates to race win probability. These same values are used as the baseline win probability for a driver. 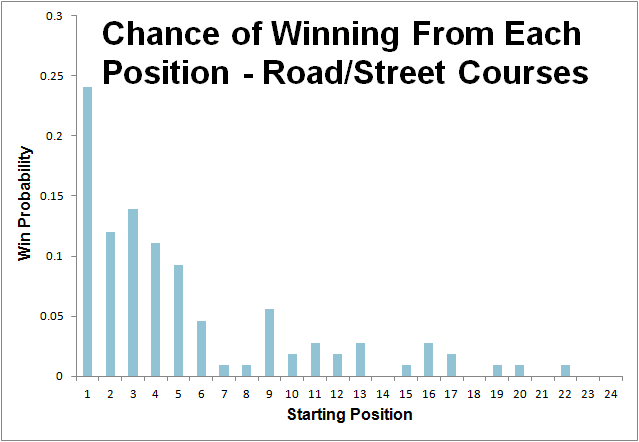 These values are different for road/street courses and ovals, as the probability of winning from different places is different depending on the type of track. The number of wins a driver has over the past three years is the next variable. If a driver has won 20 percent of the races the last three years, you could say there’s a 20 percent chance he’ll win the next one. How a driver has fared at a track in the past is also included. If a driver has won two of the last three races at a track, most of the it means he’s pretty good there. This variable rewards drivers who have a “good” track and knocks down drivers who have never had a good result there. That’s it. You can find the race predictions for each 2016 race here.